Sunday March 5, 2017 marks the beginning of National Dental Assistant Week 2017! This week is dedicated to all of the hardworking dental assistants out there. Those working in dental assistant jobs are an important part of the healthcare team. In appreciation for all they do, we want to say thank you! This week we recognize all of our dental assistant graduates, students, and faculty. You and your efforts are appreciated! Are you interested in learning more about becoming a dental assistant? Read on for some helpful info! Those pursuing dental assistant careers may enjoy a path that can be both challenging and rewarding. Dental assistants assist dentists, set up equipment, prepare patients for dental treatments, and maintain records. Dental assistant jobs are found within dentists offices. Dental assistants work under the supervision of a licensed dentist and work closely with dental hygienists. Depending upon where you live or where you want to work, the scope of practice may be different. Simply put, there may be some dental assistant requirements by state. It is always a good idea to check with the state where you wish to work to see if they have specific requirements for dental assistants. Dental assistant responsibilities may also vary based on where they work. Dental assistant tasks may include clinical and administrative responsibilities. Clinical tasks may include assisting dentists with procedures, preparing equipment, materials, and patients and, provide instructions and information to patients. Administrative tasks may include scheduling appointments, recording treatment information, take and record medical and dental histories, order supplies and materials, and maintain inventory. If pursuing a career as a dental assistant sounds like it may be right for you, a good first step is to consider dental assistant training programs. Dental Assistant training offered at Dorsey Schools can help you prepare for a career in the dental healthcare field. The Dental Assistant training program at Dorsey Schools is designed to prepare students to become a professional member of the dental healthcare team and provide dental care to patients under the direct supervision of a licensed dentist. Throughout our dental assistant program, students have to meet various dental assistant requirements and skills. Some of those dental assistant skills include administrative dental office procedures, electronic health records, dental anatomy and physiology, terminology, dental materials, preventative oral care, two-handed and four-handed chairside assisting, radiography, sterilization, instrumentation, pharmacology, dental specialties and laboratory procedures. Completion of the Dorsey Schools Dental Assistant program is designed to prepare students to challenge two components of a national certification exam. 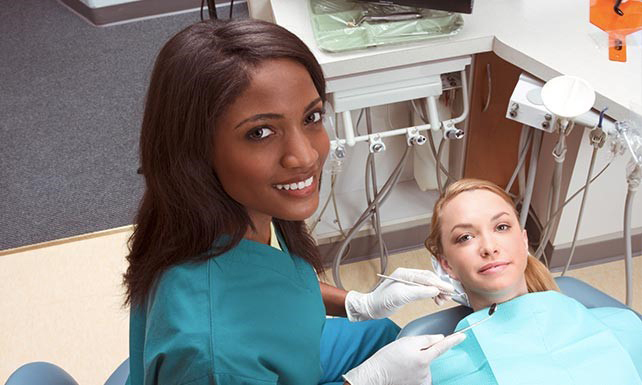 An externship component is included in the Dental Assistant program. The externship will allow students to assimilate knowledge used in the program into practical application. Are you wondering, how long is Dental Assistant school? Well, at Dorsey Schools, you can complete your Dental Assistant training in just one year! The Dental Assistant training program at Dorsey Schools is offered at the Roseville, MI and Dearborn, MI campuses (both are branch campuses of Madison Heights). Ready to learn more? Contact Dorsey Schools by calling 888-422-1188 or you can request info online. program, and other important information, please click here. https://www.bls.gov/ooh/healthcare/dental-assistants.htm (visited March 05, 2017).